Presented by Children’s Miracle Network Hospitals! PRICING IS DETERMINED BY RESORT, RACE TYPE, AND NUMBER OF GUESTS. Maximum of 2 race registrations per room. You may have the allowed number of guests permitted by your Disney Resort on your room reservation but you are only guaranteed two adult race registrations per room reservations (minor children are exempt from this restriction). If you need additional registrations you will need to book additional race/room packages through Moments of Magic Travel. Your Non-Refundable deposit is equal to the full amount of each race registration(s) Entry Fee, and a $200 room deposit. Your deposit is NON-REFUNDABLE. Race Registration Packages are non-refundable, non-transferable, and non-deferable. The balance of your package must be received no later than January 1, 2019. You must complete and return the 2019 Race Booking Form via fax or email within 48 hours of your race registration deposit payment. Failure to return your completed form will result in an immediate refund of your registration deposit payment and the forfeit of your early race registration. The sale of registration packages is on a first come, first served basis! 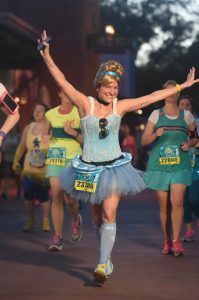 Get your running shoes ready, and secure your registration ahead of the crowds with Moments of Magic Travel! Come runDisney with us!!!! You are required to complete the Moments of Magic Travel Race Registration form in its entirety within 48 hours of your race registration package deposit by clicking here. Failure to return your completed form will result in an immediate refund of your registration deposit payment and the forfeit of your early race registration. You will receive a confirmation from Moments of Magic Travel within 48-72 hours. Get ready to runDisney! ©Disney All Disney names and logos are used with permission, which in no way constitutes an endorsement by Disney, express or implied, of any organization, company, or fundraising campaign. Disney does not control or guarantee the accuracy, relevance, timeliness or completeness of information contained on this website. The views and opinions of authors expressed herein do not necessarily reflect those of Disney, and agreement with those views may not be implied by use of the Disney names and logos.